Objective: A new class of ethylene/propylene-1H-1,2,3-triazole-4-methylene-tethered isatincoumarin hybrids 8a-j, integrating three anti-tuberculosis pharmacophores coumarin, isatin and 1,2,3- triazole was designed and synthesized. Method: These hybrids were assessed for their in vitro anti-TB activity against MTB H37Rv and MDRTB, as well as anti-bacterial activity against Gram-positive and Gram-negative strains, and cytotoxicity in VERO cell line. Results: The results showed that all hybrids with acceptable cytotoxicity (CC50: 64-512 µg/mL) exhibited weak to moderate anti-microbial activity. The most active hybrid 8i with MIC of 50 µg/mL against MTB H37Rv and MDR-TB, also has excellent cytotoxicity profile (CC50: 128 µg/mL). Conclusion: The resistance index of hybrid 8i was 1, indicating that hybrid 8i has no cross-resistance with the first-line anti-TB agent. Thus, hybrid 8i could act as a lead for further optimization. 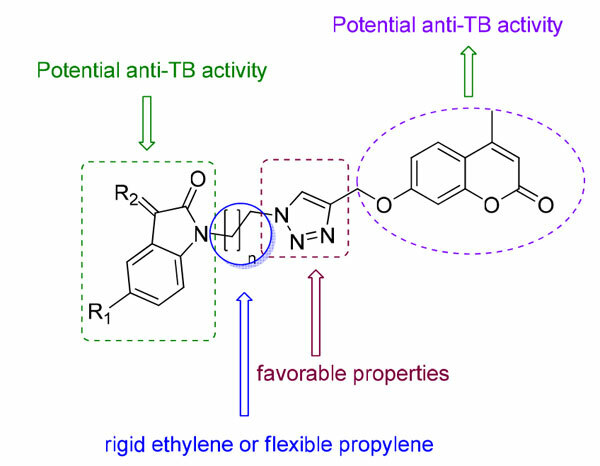 Coumarin, 1, 2, 3-triazoleisatin, Hybrid compounds, Anti-bacterial, Anti-tuberculosis activity, Structure-activity relationship.